...Maimonides took that last statement of the Talmud quite practically. Concerning studying astronomy from the writings of idolatrous Greeks, he writes, "Accept the truth from wherever it comes." 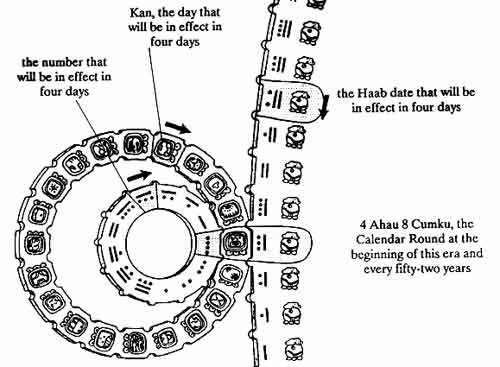 In response to a reader's email, I want to clarify something about the Mayan calendar system. First and foremost, it should be understood that the Mayans did not originate the technologically advanced information upon which their calendar was built. Some people have speculated that it originated with either a highly developed ancient civilization that predated the pyramids or even with extraterrestrial visitors. ...Seder Hadorot tells that Enoch was the first one to write a book on astronomy. In the pseudepigraph Book of Enoch, a compilation of books detailing the experiences, the prophecies, and teachings of Enoch, there is a book entitled The courses of the Heavenly Luminaries. This is chapters 72 through 82 of the Book of Enoch, and they are devoted to describing the changing times for the rising and the setting of the sun through the solar year, the waxing and waning of the moon through the lunar month and year. The Midrash explains how Enoch obtained his knowledge. Read more here. AISH - Don't get burned! Disturbing news about Aish HaTorah continues to come to light. The strategy behind Chanukah: Rock of Ages is to reach totally unaffiliated, disconnected Jews who have no interest in Judaism. An entertaining, viral film that gets enormous traffic and exposure in mainstream media (the Chanukah film was just featured on The Today Show) gets people to visit Aish.com, where we have treasure trove of articles and films that explore the deeper Torah-based meaning of Chanukah and Judaism. The idea seems to be to hide the fact that Torah makes demands on us. I don't think you can apply marketing techniques to Torah. This reminds me of the old bait and switch tactic - lure them in with some feel-good video and then hope the real Truth will grab and hold them. ...Aish.com has an impressive track record in outreach. Our recent user's survey showed that over 80% of non-frum Jews told us that Aish.com has given them a better understanding of Judaism and has increased their sense of Jewish pride. 59% said they have increased their Jewish observance. Our last two viral films garnered just under 10,000 new email subscribers. That is an enormous success." But the Torah teaches us that quality is superior to quantity. If Aish believes, as has been hinted, that the ends justify the means and that they measure their success by the numbers of subscribers to their email list, is anything off-limits? ...Jewish Israel contacted the administration of the Aish HaTorah World Center at the Kotel and asked if they were aware that Pastor Hagee had visited their center and was filmed proclaiming the gospel from their roof. Shira Plotkin, Private Events Coordinator, spoke with me and confirmed that Hagee had indeed been at Aish. Jewish Israel remained on the phone as Ms. Plotkin and Mordechai David, Director of Operations for the Aish World Center, viewed the video. This writer was asked to give Aish some time to formulate a response before releasing a report. About an hour after the initial phone conversation, Jewish Israel was called by Yossi Lapko, who introduced himself as the personal assistant to Rabbi Yehuda Weinberg, the COO of Aish Jerusalem. Mr. Lapko told Jewish Israelthat Aish can't take responsibility for what is said or done on their rooftop and that they have no control over tourists or guests. Lapko confirmed that he is fully aware of the fact that Hagee is a celebrated mega pastor and that he was aware of Hagee's visit to Aish last week. However, Mr. Lapko claims it was not a pre-planned visit with a film crew or entourage. Lapko reiterated that the Aish building is frequented by many visitors. One has to wonder if Aish has accepted donations from Hagee as have so many others. And if so, if the acceptance of "donations" might play a bigger role in directing decisions at Aish. Could this perceived willingness to bend the rules for what some might see as the greater good be behind one very questionable "rabbi's" recent advice to an equally questionable conversion candidate? Having already been rejected by the most outstanding conversion schools, she was coached to approach Aish with instructions to emphasize to them that the family has money and might be convinced to endow Aish with some of it, ostensibly in gratitude for their assistance. Once one steps onto that very slippery slope called compromise, no matter how worthy the cause, one can never be entirely sure of where one will end up. The Erev Rav are those who have the souls of Egyptians whose goal was to disrupt Bnei Yisrael's redemption and lead them back to Egyptian slavery - if not in actuality, then spiritually. And what a job they have been doing! You can take the Jew out of the exile, but the only One who can take the exile out of the Jew is HKB"H! And that day is not far off!! Binyamin Netanyahu and Ehud Barak are facing another of the periodic opposition campaigns to unseat them – this time by pressure for an early election a year before its October, 2013 date. ...The newcomer to the anti-government ranks is the party registered Sunday, April 29, by ex-broadcaster Yair Lapid as “Yesh Atid” (There is a Future). His potential partners are former Shin Bet director Yuval Diskin, former Mossad chief Meir Dagan, former Prime Minister Ehud Olmert and former chief of staff Gaby Ashkenazi. They are all casting about for a political base, together or apart, from which to tip over the current government. Incumbent President Shimon Peres cheers them on from the wings. ...The vocal opponents are a group of disaffected ex-security officials. There are questions about why they did not resign on the grounds of the views they are now voicing instead of fighting to have their tours of duty extended. Now they are casting out lines for careers in politics. ... Israel’s opposition parties gathered for the push to corner Netanyahu into announcing an early election. They got their wish sooner than they expected. The prime minister, after turning the situation over for 48 hours, assented. He figured that the key weapon adopted by his rivals to knock him over was not in fact in their hands but in his: It is up to him and him alone to decide whether to attack Iran. In fact, if an election was forced on his government, he could defeat their scheme by bringing the attack forward. So the impression of Netanyahu and Barak fighting with their backs to the wall against a body of generals is totally misleading. Their opponents are beginning to realize that their anti-government offensive has missed its mark and may well blow up in their faces. “Yesh Atid” (There is a Future) - Yes, there is and a glorious one at that, for all those who have remained faithful to Hashem and to His covenant. This is a direct message from Heaven. "It is up to him and him alone ...." - No, it's not. It's all up to HKB"H and He is the one inspiring all these political maneuverings in order to bring the conflict to fruition at His own time of choosing. And it will mean the END of the Erev Rav rule over Eretz Yisrael FOREVER! What is Really Going on With "2012"
There is a LOT of misinformation and disinformation out there about what 21.12.2012 is really all about. What does it portend and what is the proof that anything at all will happen? In short, nobody knows for sure, even the so-called experts, because this is all new territory for humankind. But all you have to do is read the news and view videos of recent world disasters to see with your own eyes that most of what was beginning to be predicted in 2008 and 2009 is already happening - massive flooding, torrential rains, increasing intensity and frequency of earthquakes, volcanoes, floods, windstorms (hurricanes, tornadoes and typhoons), and fireballs in the heavens. I'm going to do my best to bring you all the most salient points in a nutshell in order to increase understanding and decrease confusion. Any one of these points could be expanded into entire volumes and some have been, but I want to give you the big picture - to the best of my own ability to understand it - and then you can dig deeper on your own if you want further explanation (or repudiation, as the case may be). First of all, the Mayan connection: Their "long count" calendar was an astronomical calendar pinpointing astronomical events into the future with great accuracy which, by all accounts, surpasses even the abilities which exist today. In other words, they have a track record which proves they knew what they were talking about. So what was it exactly that they predicted for 21.12.2012? They predicted (and scientists now concur) that our solar system would reach its closest, unobstructed approach to the center of our galaxy on that day. ...crossing the galactic equator or the galactic plane (marked as a yellow line in the picture) and aligning with the center of the galaxy every 26,000 years. In case you were interested, it supposedly takes 230 million years for it to make a complete revolution around the outer realms of the galaxy. This is important because this is the area in which the black hole at the center of our galaxy exerts its greatest gravitational pull. 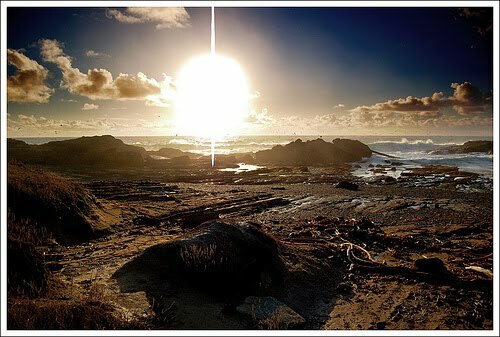 We will reach the center point of that crossing or the time of greatest influence on our solar system on 21.12.2012. Ok, so we can see how smaller objects will likely respond to the galactic center's gravitational wave and how this, in turn, will affect the larger planets, but aside from dodging space debris, the most critical element in all of this is the glowing orb at the center of our solar system - the Sun. Interestingly, the Hebrew prophets mention the Sun often in End Times prophecies about a period of time known as "The Day of the Lord" when the earth is being transformed - a time in which the Creator of the World reveals Himself through the power and forces of nature. (Isaiah 30:26)- "...and the light of the sun shall be sevenfold as the light of the seven days,...."
Also, "The Song of Deborah" (Shirat Devorah) found in the Biblical book of Judges is supposed to be an account of the final redemption and it ends off with...you got it! A reference to the Sun - "So may perish all Your enemies, O Lord; but they that love Him as the sun when he goes forth in his might." Theoretically, the super-heated core could become destabilized from the crust leading to crustal displacement causing a geographic pole shift which some say ample evidence exists for its having happened before in earth's geologic history. So far, we've only discussed the physical effects on the celestial bodies, but what about OUR bodies? Does this increasing gravitational field and resulting increase in solar radiation affect human beings as well? And while we've discussed physical manifestations, what about the spiritual ones? Is the soul affected, too? I could not find ready answers to these questions, but the recent reports of abnormal behavior among airline crews may offer us a clue. Again, this event only happens every 26,000 years, so no one has any previous experience with it, but some believe that ancient cultures like the Mayans and the Egyptians had a tradition about what to expect to happen. "When the four corners of the earth rest on the dark rift, a cosmic sky portal will be opened up and souls will be harvested." ...A tremendous surge of energy continually emanates from the center of the galaxy, the spiral whirlpool of the Milky Way. This energy does not approach the earth directly, rather it passes through many "stations" on the way (planets and different star systems - the most well-known being the sun) that transform this pure energy and channel it to us in a new form. During this time there is a line-up of several planets that cause the earth to face the center of the galaxy head-on, thereby allowing us to receive this energy. This situation, according to the Maya, will significantly influence our consciousness, raising it to an extremely high level .... Just as the sun rises at a specific time, and there is the moment when the first infinitestimal ray of light shines, there is also a process in which we directly face the photonic light that comes from the center of the galaxy, and under these conditions on 21.12.2012 exactly - this sunrise will transpire. It has been scientifically verified.... We are presently experiencing an amazing awakening of consciousness. Why is this already happening? It is exactly like the rising of the sun. Long before we perceive the rising of the sun, it is already possible to see its light. ...It is the dawn of the rising of the galaxy! These photonic rays will increasingly influence our awareness and will raise the frequency of our consciousness to the ultimate levels possible. ...If we are not able to receive these high frequencies, we will be negatively affected. As the prophet said - "...all the audacious sinners and all the perpetrators of wickedness will be stubble. And the sun that comes shall burn them up .... And the sun of mercy shall rise with healing in its wings for you who fear My Name." If all of this really comes about, and there certainly is evidence to support it, those who say it will be the end of the world as we know it will be correct and so will those who say it will be a spiritually transformative event which will lead to a new age of peace and harmony among mankind. We Jews have been looking forward to just such a time for thousands of years. We call it the Messianic Era or Days of Mashiach and the Light at the center of the galaxy could very well be the Ohr Ganuz, or the Original Light of Creation which was "put away for the righteous in time to come." If you find errors, please let me know. It took many hours to compile and much research to try to understand and pull it all together. And do please check out all the embedded links! Before Jews ruled again in our own land, we would be arrested for blowing a shofar at the Western Wall. Well, today, we can blow as many shofarot at the Western Wall as we like, but we would still get arrested for blowing one on the Temple Mount. The geula is not finished yet. G-d willing, SOON, we will blow as many shofarot as we like on the Temple Mount!! It's not a small thing that we do here. It's the future of the world! CHANCE OF FLARES: Sunspot AR1465 has developed a 'beta-gamma-delta' magnetic field that harbors energy for X-class solar flares. Because of the sunspot's location near the middle of the solar disk, any eruptions will likely be Earth-directed. QUIETING STORM, MORE TO COME: Earth's magnetic field is quieting after two straight nights of mild to moderate geomagnetic storms. At the height of the disturbance on April 23-24, auroras were spotted in more than a dozen US states including Michigan, Nebraska, Kansas, Wisconsin, North Dakota, South Dakota, Iowa, Illinois, Minnesota, and Colorado. On the threshold of the Arctic Circle in Anchorage, Alaska, the Northern Lights pierced the glow of the midnight sun. 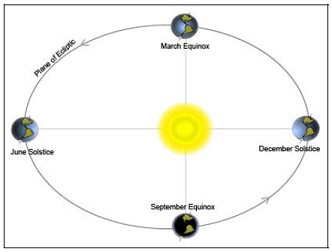 Here is some additional sun news that will make up part of my upcoming report on What is Really Going on With "2012." (Spacedaily.com) Approximately every 11 years the magnetic field on the sun reverses completely - the north magnetic pole switches to south, and vice versa. It's as if a bar magnet slowly lost its magnetic field and regained it in the opposite direction, so the positive side becomes the negative side. But, of course, the sun is not a simple bar magnet and the causes of the switch, not to mention the complex tracery of moving magnetic fields throughout the eleven-year cycle, are not easy to map out. This flip coincides with the greatest solar activity seen on the sun in any given cycle, known as "solar maximum." Currently the polarity at the north of the sun appears to have decreased close to zero - that is, it seems to be well into its polar flip from magnetic north to south - but the polarity at the south is only just beginning to decrease. "Right now, there's an imbalance between the north and the south poles. The north is already in transition, well ahead of the south pole, and we don't understand why." The asymmetry described in recent research papers belies models of the sun that assume that the sun's north and south polarities switch at the same time. In addition, both papers agree that the switch is imminent at the north pole, well in advance of general predictions that solar maximum for this cycle will occur in 2013. Lastly, the direct Hinode results also suggest a need to re-examine certain other solar models as well. Measuring the magnetic activity near the poles isn't easy because all of our solar telescopes view the sun approximately at its equator, offering only an oblique view of the poles, when they require a top-down view for accurate magnetic measurements. It was discovered in 2003 that as the sun moves toward solar maximum, giant eruptions on the sun, called prominence eruptions - which during solar minimum, are concentrated at lower solar latitudes - begin to travel toward higher latitudes near the poles. In addition, the polar brightness in the microwave wavelengths declines to very low values. "These prominence eruptions are associated with increased solar activity such as coronal mass ejections or CMEs, so CMEs originating from higher latitudes also point to an oncoming solar maximum. When we start to see prominence eruptions above 60 degrees latitude on the sun, then we know that we are reaching solar maximum." 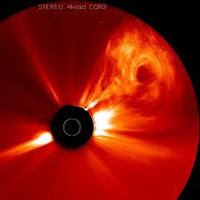 By mapping the brightness of microwave radiation throughout the chromosphere, the scientists showed that the intensity at the north pole has already dropped to the threshold that was reached in the last solar maximum cycle, suggesting the onset of solar max there. This is backed by the fact that prominence eruptions are also occurring at high latitudes in the north. Eruption activity in the south half of the sun, however, is only just beginning to increase - the first CME occurred there in early March 2012. The Hinode data also shows this discrepancy between the north and the south. The magnetic map of the poles of every month since September of 2008 showed large, strong concentrations of magnetic fields that are almost all magnetically negative in polarity. Recent maps, however, show a different picture. Not only are the patches of magnetism smaller and weaker, but now there is a great deal of positive polarity visible as well. What once pointed to a strongly negative north pole, is now a weakly magnetized, mixed pole that will become neutral - which occurs at solar maximum - within the month according to the team's predictions. "This is the first direct observation of this field reversal. And it is extremely important to understanding how the sun's magnetism generates the solar cycle." Typical models of the magnetic flip, suggest that as active regions rotate around the equator, their higher, trailing edge - which is almost always the opposite polarity from the pole in their hemisphere - drift upward, eventually dominating the status quo and turning positive to negative or negative to positive. The Hinode data show that this transition at the north began BEFORE such drifting had a chance to occur. "This is one of the most interesting things in this Hinode paper to me. How did the polar reversal start so early, even though the onset of the solar cycle, that is, increased activity at lower latitudes, hadn't begun yet?" The idea that asymmetries exist in the sun is not completely new. Other work has recently emphasized symptoms of this asymmetry, measuring, for example, more sunspots in the northern hemisphere than in the south at the moment. "But most of the well-developed models don't incorporate the asymmetry in them. More complicated models that incorporate asymmetries do exist, but they have other ways in which they fail to match observations." Scientists will keep their eye on the current cycle - numbered Solar Cycle 24 - because a polar switch at the north that is sooner than was expected also implies this may be a fairly small cycle in terms of the number of sunspots and amount of solar activity. Or it could be something else entirely - like a Super-Max Cycle as proposed by Patrick Geryl. With Yom HaZikaron and Yom HaAtzma'ut this week, our thoughts naturally dwell on the State of Israel and its army. Before we get into things, let me switch from the editorial WE to the personal first-person singular. I must say that the following does not necessarily reflect OU policy, but I would hope and pray that it is close. I also have to say that the following might rub some TTreaders the wrong way, but I hope and pray that it will be taken seriously and given serious thought. When it comes to Medinat Yisrael - particularly celebrating Yom HaAtzmaut and thanking G-d for the State (which are not necessarily the same thing), we have to separate two issues. The principle and the details. Let's mention the details first, assuming (which is a big assumption) that one agrees in principle that we owe a debt of gratitude to G-d for the establishment of the State of Israel. Then the questions of Hallel yes or no, with or without a bracha, P'sukei d'Zimra of Yom Tov or not, Tachanun or not, Lam'natzei'ach or not, reading from Yeshayahu 10-12 or not, shaving in honor of the day or not, suspension of other S'fira practices or not, and a whole bunch of other issues, yes or no. However strongly one feels about any of these details - and many of us do, on both sides of each item, the basic agreement about the principle allows one to argue his side (backed up by reliable p'sak) and, perhaps, be reasonable about other opinions. But... when it comes to the principle, here is the real problem. And here is the sharp personal feeling I referred to earlier. I believe, with all my heart, that an observant Jew who does not feel that we need to thank G-d for the State of Israel - with all of its shortcomings and problems, is holding back the Geula Sh'leima process. I picture G-d's saying to Himself (so to speak), let Me give them a major step on the road to the Complete Geula and see how they handle it. Good, some of the people say and mean ZEH HAYOM ASA HASHEM... This is a day that G-d made; let us rejoice. Good, some have a Seuda of Gratitude in honor of the establishment of the State. But what's wrong with the others - don't they realize that things happen in stages and that this stage is a big one? Don't they see the serious beginning and progress of the Ingathering of the Exiles? Don't they appreciate the State for Shabbat being the national day of rest and for Kashrut being the norm rather than the exception? And don't they see the unbelievable strides in Torah education and in the broad adherence to Jewish Tradition, even if full observance still has a long way to go? Do they not see the half-full cup? Is that not enough to say thank you and work for more? As Rabbi Gold is fond of saying: They bless G-d for the first of the season watermelon, how come they don't bless Him for the Medina? This, then, is much more than a difference of opinion. It is a matter of principle. A very significant principle. The first yeshiva student - perhaps the most significant one ever - was Yehoshua bin Nun. The Torah tells us that he was a fulltime student - he never left the Tent. Yet it was him that G-d instructed Moshe to call upon to form the army to fight against Amalek. And that was the beginning of a long military career for him. Remember though, that it was Yehoshua who received Torah from Moshe and transmitted it to his generation and to the further generations of the Z'keinim (Shoftim). Yehoshua is a major link in the entire Chain of Tradition. 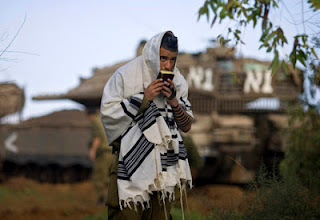 With Hesder and other religious army service arrangements, and Nachal Chareidi, there are different options for the religious prospective soldier. And the more religious people who join the army, the better conditions get for the religious soldier. And there are many good reasons for all girls to be required to perform National Service of one kind or another. community does not carry its weight in defense of this country. Many feel that they have larger burdens of milu'im than they would if more religious Jews would serve in the army. Reserve duty often disrupts family life and one's business - many feel that their reserve time would be reduced and more fairly distributed if more people would serve in the army. This perception causes a lowering of the esteem for Torah and religious Jews in the eyes of the less-religious and non-religious population. This is one of the definitions of Chilul HaShem. Bottom line, it is the right thing to do for an eligible fellow, to serve in the army in some framework. And it will also be a Kiddush HaShem (or at least, alleviate a possible Chilul HaShem). Here's the real bottom line: May it be G-d's Will, that just as we have been privileged to the beginning of the Redemption, so may we merit hearing the sound of the Shofar of Mashiach, speedily in our time. And not just because I get to eat rice and peas on Pesach! While some hareidi religious leaders have the reputation of being dismissive of the efforts of the IDF – and of advocating that as many young people as possible take on full-time yeshiva study instead of serving – Rabbi Ovadia Yosef said on Wednesday that without the IDF's efforts to defend the country and people of Israel, the notion of a yeshiva as it is understood in Israel today could not exist. Rabbi Yosef, former Chief Rabbi and prolific author of dozens of books on Jewish law and philosophy, is considered the dean of the Sephardic Hareidi world, and is seen as one of the world's leading hareidi rabbinical leaders. On Wednesday, Rabbi Yosef led prayers at his Har Nof home as he does daily, and offered a special remembrance prayer for fallen IDF soldiers, in commemoration of Memorial Day, which Israel is commemorating Wednesday. I used the terms "luxury and ease" in relation to Jewish life in chu"l in a comment and someone was quick to respond that they aren't living the high life in chutz la'aretz. I'd like to point out that the terms are relative. When I think "luxury and ease," I think about hot water on demand. I think about having a car. About taking my groceries from the store's cart to my trunk and driving it all home into a driveway right outside my door and carrying them no further then the distance between the car and the kitchen. I have not driven a car since April 1996 when I came on aliyah. The reason is partly finances and partly choice. I can't afford to buy or fuel or insure one, but I also enjoy the freedom of not having to house one and feed it and take it for repairs when it breaks down or needs "new shoes." Not to mention that as the population expands, every bit of green space will have to be converted to roads and parking to accommodate this mixed blessing if every person will insist on owning his own vehicle. There have to be limits to private consumption. Anyway, this is how I get around now. On my own two feet with a shuk buggy (cart or aggala, take your pick) to carry what my hands can't hold. That usually includes all the groceries each week. When my family was larger, I used this kind. When I had to move across town, I borrowed one like this and took it on the bus. They fold up for easy storage on your mirpeset. The hardest thing about using shuk buggies for transport is the steps. 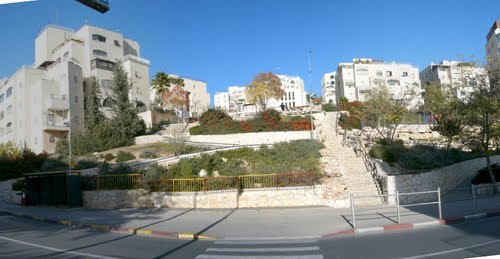 Many neighborhoods around the country are built terrace-style up the sides of hills, like this one in Har Nof. When I first came to Israel, I lived up North in a development town where I had to drag my shuk buggy up 92 steps to reach my house from the major grocery. Well, I could have paid for delivery, but then you never know when it's going to arrive and it's usually Arabs who are bringing it. For really major shopping like Pesach and Sukkot, I've indulged myself and hired a taxi. Now, that is real "luxury and ease!" Note: They're called shuk buggies because they are commonly used while shopping the stalls in the shuk where your hands can quickly fill to capacity and there is not space for anything larger. "[We will] reduce all the rat-like groups and the bases for provocations to ashes in three or four minutes, (or) in much shorter time, by unprecedented peculiar means and methods of our own style." Ezekiel 36:24 - "For I will take you from among the nations and gather you from all the countries, and I will bring you to your land." Today, almost 6 million Jews are living in the land of our forefathers. Could they have succeeded without the blessing of The Master of the World? The Beginning of Aliyah - In accordance with the Vilna Gaon's wishes, three groups of his disciples and their families, numbering over 500, made aliyah to the Land of Israel between 1808 and 1812, a movement documented in Arie Morgenstern's book, Hastening Redemption. This immigration is considered to be the beginning of the modern Jewish settlement in Palestine. The First Aliyah (also The Farmers' Aliyah) was the first modern widespread wave of Zionist aliyah. Jews who migrated to Palestine in this wave came mostly from Eastern Europe and from Yemen. "The First Aliyah began in 1882 and continued, intermittently, until 1903". An estimated 25,000–35,000 Jews immigrated to Ottoman Syria during the First Aliyah. The Second Aliyah was an important and highly influential aliyah that took place between 1904 and 1914, during which approximately 40,000 Jews immigrated into Ottoman Palestine, mostly from the Russian Empire, some from Yemen. The Third Aliyah refers to the third wave of Zionist immigration to Palestine from Europe between 1919 and 1923, from the end of World War I until the start of the economic crisis in the country. ...40,000 Jews arrived in Palestine during the Third Aliyah. The Fourth Aliyah (1924 - 1928) - In the middle of 1924, a new wave of immigration set in, different in social composition from its predecessor. There had been a drop in the inflow of pioneers, mainly because of the restrictions on departure from Soviet Russia. On the other hand, there was a rise in the immigration of middle-class people -- shopkeepers and artisans -- mostly from Poland. Youth Aliyah - After the election of Hitler as Chancellor of Germany, the Nuremberg laws were enacted. Jewish children were among the first victims of discrimination and harassment. Recha Frier and Henrietta Szold implemented a plan of saving German Jewish children by sending them to collective farms and villages in Eretz Yisrael where they were reared and educated under the auspices of Youth Aliyah. During the war years over 11,000 children were rescued by Youth Aliyah. Aliyah Bet ... was the code name given to illegal immigration by Jews to the British Mandate for Palestine in violation of British White Paper of 1939 restrictions, in the years 1934-1948. ...The Aliyah Bet is distinguished from the Aliyah Aleph ...: the limited Jewish immigration permitted by British authorities in the same period. Aliyah from Arab countries - From 1948 until the early 1970s, around 900,000 Jews from Arab lands left, fled, or were expelled from various Arab nations. In the course of Operation Magic Carpet (1949–1950), nearly the entire community of Yemenite Jews (about 49,000) immigrated to Israel. Most of them had never seen an airplane before, but they believed in the Biblical prophecy that according to the Book of Isaiah (40:31), God promised to return the children of Israel to Zion on "wings". ... 114,000 Jews came from Iraq in 1951 in Operation Ezra and Nehemiah. Aliyah from Iran - Over 30,000 Iranian Jews immigrated to Israel following the Islamic Revolution. Most Iranian Jews, however, settled in the United States (especially in New York City and Los Angeles). Ethiopian Aliyah - In 1977 30 families came. Between 1977 - 1984, 3000-4000 Ethiopian Jews came to Israel, primarily from the Tigrae region. "Operation Moses" brought another 8,000, mostly from Gonder. During that Aliyah, approximately 4,000 lost their lives in the desert wastes and refugee camps of Sudan. "Operation Solomon" saw another 15,000 Ethiopian Jews reach Israel, and small groups have continued to congregate in Addis Ababa, and immigrate ever since. Today there are approximately 85,000 Ethiopian Jews in Israel, 20,000 of who were born here. 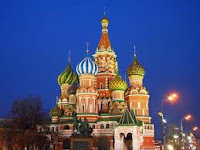 Aliyah from the Soviet Union and post-Soviet states - In the years 1960–1970, the USSR let only 4,000 people leave; in the following decade, the number rose to 250,000. Many of those allowed to leave to Israel chose other destinations, most notably the United States. In 1979 a record 71,000 Soviet Jews were granted exodus from the USSR, of whom only 12,117 immigrated to Israel. Since the dissolution of the USSR, over one million Soviet Jews have immigrated to Israel. Argentine Aliyah - In the 1999–2002 Argentine political and economic crisis that caused a run on the banks, wiped out billions of dollars in deposits and decimated the country's middle class, most of Argentina's estimated 200,000 Jews were directly affected. Some chose to start over and move to Israel, where they saw opportunity. More than 10,000 Jews from Argentina immigrated to Israel since 2000, joining the thousands of previous olim already there. The crisis in Argentina also affected its neighbour country Uruguay, from which over 500 Jews made aliyah in the same period. From the 1990s - Since the mid 1990s, there has been a steady stream of South African Jews, American Jews, and French Jews who have either made aliyah, or purchased property in Israel for potential future immigration. Specifically, many French Jews have purchased homes in Israel as insurance due to the rising rate of anti-Semitism in France in recent years. The Bnei Menashe Jews from India, ... slowly started their Aliyah in the early 1990s and continue arriving in slow numbers. In early 2007 Haaretz reported that aliyah for the year of 2006 was down approximately 9% from 2005. They state that: "Only 19,264 people immigrated to Israel in 2006, down nine percent from 2005. It is the lowest number of immigrants recorded since 1988." The number of new immigrants in 2007 was 18,127, the lowest since 1988. Only 36% of these new immigrants came from the former Soviet Union (close to 90% in the 90's) while the number of immigrants from countries like France and USA is stable. Some 15,452 immigrants arrived in Israel in 2008 and 16,465 in 2009. 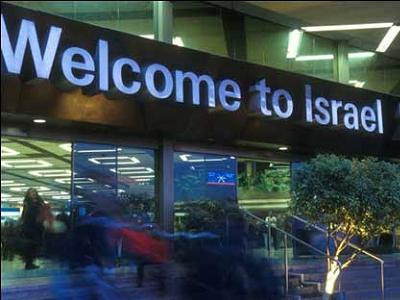 Shalom Life reported that over 19,000 new immigrants arrived in Israel in 2010, an increase of 16 percent over 2009. I received an email that made me realize that people may get the wrong idea about videos that I post. I do not endorse any individual or their work. If I post a video, it is because it is the content that I find interesting or credible and it has nothing whatever to do with whoever is presenting the material. The Coast to Coast interview video with The Horizon Project's Brent Miller that I recently posted must have been done in 2009. It appears that it was only uploaded to Youtube in late 2011. The Horizon Project website does not seem to have been updated since 2009 either. That said, the fact that the "mainstream" scientific community denigrates someone's work or conclusions does not automatically mean it's wrong. The surest sign that a person may be onto the truth is when others ridicule him rather than bringing opposing data. In any case, where the "scientific community" is concerned, history shows that those who went out on a limb at the risk of being professionally ostracized usually turned out to be right in the end. Winter finally arrives -- in April! ...And it shall be at the end of the days, that the mountain of the Lord's house shall be firmly established at the top of the mountains, and it shall be raised above the hills,.... And they shall come into the caves of the rocks and into the hollows of the earth, because of the fear of the Lord and because of the splendor of His pride, when He rises to break the earth. Therefore we will not fear when the earth changes and when mountains totter into the heart of seas. ...Mountains melted like wax from before the Lord ... For the stars of the heavens and its constellations shall not allow their light to illuminate, the sun has become dark in its going forth, and the moon shall not shine its light. ...I will make heaven quake, and the earth will quake out of its place,...for windows from above have been opened [the dark rift at the center of the galaxy pictured above?] and the foundations of the earth have trembled. The earth has broken; the earth has crumbled; the earth totters. It sounds strangely like all the "wild" predictions being made in many corners for the day when our planet comes closest to that black hole at the center of the galaxy - 21.12.2012. The Church made the mistake of allegorizing all the prophecies about an Israel physically restored to its own land. Before 1948, it was inconceivable, but today...! Realizing that all these descriptions of massive earth changes could very well be taken literally puts a whole new light on them. Look, we can't possibly know for sure if any of these 2012 predictions will come true, but if they do begin to take place, we will understand why and will be able to take comfort in knowing that it was also discussed in our sources - the same sources which assure us that Mount Zion, the Temple Mount, will be a place of refuge. Our tradition tells us that it was from the Even Hashtiyah - The Foundation Stone - that the world was created. 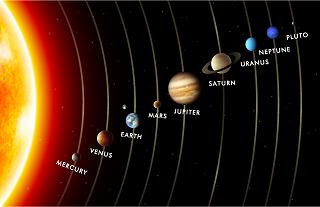 It is anchored in place as the spot that connects Heaven and Earth; therefore, it is the only truly stable spot on the planet. 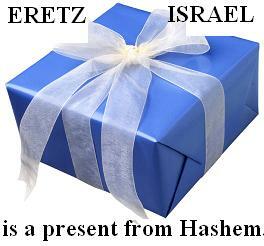 I bless us all to merit, out of the abundance of Hashem's great mercy, to live and survive to talk about it in 2013! A few days ago, I read something that has been bothering me - a lot. I've thought and thought about it before deciding to blog about it, so don't think I'm speaking in anger - not at all. I'm addressing this issue out of love for my fellow Jews no matter where they are. And believe me when I say that I can empathize with you and your situation wherever you are. I feel for the Jews in chu"l. I've been there. I understand the fear, the doubt, the confusion, the conflict of thoughts and emotions when it comes to deciding whether to make aliyah or not. I can also identify with the Jews who made that choice and now feel some regret, some angst about whether they chose correctly or not. But, while I feel I can honestly say I understand, I can't in good conscience sit by and condone by my silence what amounts to slander against Eretz Yisrael and against the Borei HaOlam. It's okay to admit our weaknesses and to seek encouragement to overcome them, but it's not okay to rationalise and justify them by condemning others. I read an exchange recently, and unfortunately, I have to say it's not the first time, where someone justified his unwillingness to consider making aliyah to Eretz Yisrael because of a whole list of "sins" which he enumerates - terrible things to be sure. And it's true that all the horrors of Western society have found their way into our Holy Land. But, it's the height of hypocrisy to say, "I won't lower myself to live among sinners in Eretz Yisrael, but I have no problem living among the exact same sins in the impure lands of dispersion." What's more, by refusing to come and add to the numbers of Torah-observant Jews, thereby increasing their power to amend the laws and to eliminate these sins from the Holy Land, they are partly responsible for what is going wrong. And it gets worse! All the Torah and mitzvot in chu"l is actually giving power and sustenance to the evil forces which rule over those impure lands who then use it to turn and around and subjugate the faithful Jews of Eretz Yisrael! This might be hard to hear, but it's the truth and if it applies to you, you need to not take offense, but take it to heart and do something about it if it's in your power to do so. Furthermore, to say that the situation in Eretz Yisrael is simply not to your liking is a slap in Hashem's face. The situation may not be to our liking or to His, but it's what it is because HE has allowed it to be so, for His own reasons, most likely to maintain free will. I mean, if things were perfect in Eretz Yisrael, who wouldn't want to make aliyah? Including the goyim!? Where would be the challenge or the reward in making aliyah then? Things are actually getting so good here that it's getting harder and harder to keep from being completely overrun by goyim from all over the world! (Rambam: Hilchot Melachim, Chapter 5, halacha 12) - “A person should dwell in Eretz Yisrael, even in a city whose population is mostly non-Jewish, and not live in “chutz la’aretz”, even in a city which is mostly Jewish.”For those who prefer to remain in chu"l and only come home to Eretz Yisrael when Mashiach personally brings them out, I should also point out that were it not for your brothers and sisters who sacrificed what you are unwilling or afraid to sacrifice to build Eretz Yisrael up into what it has become today, there would be no Eretz Yisrael for you to come to with Mashiach. It's a chutspah to expect only to reap the rewards of the work others have done without any intention to assist in that work. It never ceases to amaze me that goyim come from Thailand, the Phillipines, Korea, and every country in Africa and even while operating illegally! they manage to survive and thrive and have children and at the same time there are Torah and mitzvah-observant children of Hashem who actually belong here, - whom He yearns to see here - who doubt His ability or willingness to provide for them all that they could possibly need here. If you knew how much you hurt Hashem when you disparage the treasure of His Holy Land and the gift He made of it to you, you would be so ashamed and full of regret. Any true Jewish neshamah would. If you're going to rebel against the Creator's will and purposely refuse to come home, please don't compound that error by speaking against the Land and against the way Hashem runs it. You'll save yourself many sorrows. The Yalkut Shimoni, Midrish Shmuel and Rashi on Hoshea 3:5 says the following. “The Children of Israel were exiled because they despised three things: the kingdom of heaven, the kingdom of David and the Beit Hamikdash. R Shimon ben Menassiya stated: The people of Israel will not be shown a good sign until they return and seek out these three things. As it says (Hoshea 3:5) “Afterwards the children of Israel will return and seek out the lord” – this refers to the Kingdom of Heaven; “and David their king” – according to its simple meaning; “and they will tremble for the Lord and his goodness”-this refers to the Beit Hamikdash, as it says (in Devarim 3:25) “This good mountain”. The Yalkut also states “The people of Israel were exiled only because they despised Eretz Yisrael, as it is written, “And they despised the desirable land” (Tehillim 106:24). Rav Techtiel mentions that the 3 things which we must seek out can only be attained in Eretz Yisrael. It is for this reason that our holy sages instituted that we should Daven 3 times a day in the Shemona Esrei and “seek out” these three things. The Six Days War, which by all accounts was seen as the most miraculous war of Israel's modern history with reputedly strong messianic energy, took place in the Hebrew year 5727, a transposition of this year's date - 5772. Even in the wars one can see the redemptive "process" at work. The lands were restored into our hands in increasing kedushah. First, in 1948, Jewish sovereignty was restored in Eretz Yisrael, but despite a valiant effort, Yerushalayim, Hevron, Yericho and Shechem were lost. Then, in 1967, Yerushalayim , Hevron, Yericho and Shechem were restored to us, but despite the famous cry of "Har Habayit b'yadeinu!" the Temple Mount was handed over to the Arabs. And Arabs continued to be a vast majority in the Old City, Hevron, Yericho and Shechem making our hold on these places tentative at best. There is a very credible threat to bring the government down in the next two weeks. Might this crisis spur Netanyahu to go ahead with an attack on Iran in order to save his coalition? Will that event spread - as all the "experts" are predicting - into an all-out conflagration with all our neighbors, bringing about the next major war of redemption? Daniel 12.11,12 --- And from the time the daily sacrifice was removed and the silent abomination placed, is one thousand, two hundred, and ninety [years]. Fortunate is he who waits and reaches days of one thousand, three hundred, and thirty-five [years]. A difference of 45 years and this year, May 20th will mark 45 years since Yerushalayim was unified. 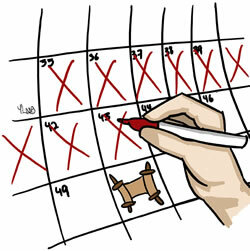 And 2,844 years ago, Shlomo HaMelech began building the First Temple in the month of Iyar. Once all impediments are removed, we, too, will begin to build - The Third Temple - to our God. Why shouldn't it also be in the month of Iyar - the month of Ziv - "brilliance?" It is related in the Prophets (Kings I, 6:1) that King Solomon began the building of the First Temple "in the fourth year of Solomon's reign over Israel, in the month of Ziv, which is the second month, he began to build the House of G-d." The Radak explains: "The month Ziv is the month of Iyar... and it is called Ziv, as our sages explain, because of the splendor of the trees, namely the brilliance of the flowers and buds." Ziv means "splendor" or "brilliance." In this month of "brilliance" King Solomon "began to build the House of G-d."
The two names of the month, Ziv and Iyar (from "or," the primary word in Hebrew for "light"), are indeed two synonyms for "light." They both relate to the special light that shines in this second month of the Jewish calender. In particular, Iyar refers to the light source (or to the light within and proximate to its source), whereas Ziv refers to the expansion of radiant-energy as it shines far from its source. With regard to G-d's Divine light, the Ziv is that radiance which descends from its source to shine on the Jewish soul as enclothed in a physical body on earth, and to awaken in it the desire to build a House for G-d (within the context of physical reality, far removed, as it were, from the source of Divine light). The Midrash (Tanchuma, Naso 16) states the ultimate purpose of creation: "The Holy One, Blessed be He, desired a dwelling place in lower reality." The Exodus from Egypt, in the month of Nissan, signifies the escape from boundaries of typical worldly assumptions (olam, "world," shares the same root as the word ne'elam, "concealment" of Divinity and of the soul's ability to sense the ultimate purpose of creation). This is the general physical and spiritual renewal of the consciousness of the Jewish soul. In the month of Iyar, the soul is further awakened and inspired with the desire to build an eternal House of G-d "in lower reality." From the outset of creation until the giving of the Torah, the Creator decreed that the "higher reality" shall not descend to the "lower reality" nor shall the "lower reality" ascend to the "higher reality." With the giving of the Torah (in the third month of Sivan) this decree was nullified (Midrash Tanchuma, Vaeira 15) as it states, "and G-d descended on Mt. Sinai" and "Moses ascended to G-d." The two preceding months of Nissan and Iyar prepared the way for the annulment of the decree. In Nissan, at the Exodus, "the King of Kings, Blessed be He, revealed Himself to His people." Here, the "higher reality" revealed Himself (while remaining in His place, as it were) to the "lower reality." In Iyar, the "lower" one is intensely aware of its "lowly" status. However, because of this very awareness, it simultaneously senses the ultimate purpose of creation and sees that the desire of "the tzaddik of the world" (G-d is called tzaddik in Deutoronomy 32:4) is to dwell specifically amongst the "lower" ones; it is certain that "the passion of the tzaddik [G-d's passion in creation] He will fulfill" (Proverbs 10:24). During Iyar, the "lower reality" is slowly refined to become a proper vessel able to receive the revelation of the essence of the "higher reality." This is accomplished by fulfilling the commandment of sefirat ha-omer ("the counting of the omer; the word for "counting," sefirah is from the same root as "saphire," the brilliant stone known as even sapir, denoting the light scintillating from within lowly materiality). See more at Gal Einai institute. WASHINGTON – The Russian military anticipates that an attack will occur on Iran by the summer and has developed an action plan to move Russian troops through neighboring Georgia to stage in Armenia, which borders on the Islamic republic, according to informed Russian sources. Of course, it's the Erev Rav who are quickest to condemn their own guys and to take the side of the troublemakers "peaceful protesters." They're always so attuned to what the goyim will say. I want to know why they keep sending in the army to do a policeman's job!? A soldier is trained to fight and kill. What do they really expect when someone perceived as the enemy gets in their faces? A policeman is trained to keep the peace. That's why they are alternately called "peace officers." Is it part of some evil plan to emasculate the Israeli army or are they really just that stupid!?? STOP POLITICIZING THE ARMY AND STOP SENDING SOLDIERS TO DO A POLICEMAN'S JOB!!! Rav Ronsky: Why does Israel Let in Anarchists? Former Chief IDF Rabbi, Rav Avichai Ronsky, thinks the State of Israel places its soldiers in an impossible situation when it allows anarchists to enter its territory, then demands that the soldiers be measured in their response to them. Several prominent rabbis expressed their support for Lieutenant-Colonel Shalom Eisner, who was suspended after assaulting a Danish pro-Palestinian activist with an M-16 rifle, saying that the military's decision to suspend him was impetuous. Eisner expressed remorse over his action, saying that while he should not have flung his weapon at the activist, the video footage released depicted only "60 seconds out of a two-hour event." America Under Attack - by the weather! Record Rainfall in Bay Area: "More than 700 lightning strikes"
There is a new bill in Congress that is expected to pass that would allow the government to suspend your travel outside the country if you own taxes to the IRS. 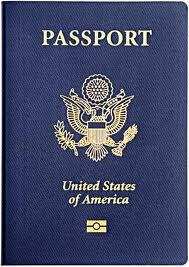 Senate Bill 1813 (Highway trust fund), which was passed by the Senate last week and is now pending in the House of Representatives contains a provision that would allow the IRS to order the State Department to refuse to grant, refuse to renew, revoke or restrict the passport of any US citizen which the IRS certifies owes the IRS $50,000 or more in unpaid taxes. There is no requirement that the tax payer be guilty of or even charged with tax evasion, fraud, or any criminal offense - only that the citizen is alleged to owe the IRS back taxes of $50,000 or more. Today, that might not affect many Jews, but who knows what they will do next. History shows that it starts like this and then gradually the net is widened until everyone is caught in it. the U.S. Nuclear Regulatory Commission (NRC) and other agencies have warned that the nuclear storage pools (the containment units that are being used to cool the nuclear fuel) have been damaged and may collapse under their own weight. Such an event would cause widespread nuclear fallout throughout the region and force the government to evacuate the nearly 10 million* residents of Tokyo and surrounding areas, a scenario which government emergency planners are now taking into serious consideration. * While the report cites a population figure of "10 million," the city itself reports its population as nearly 13 million, as of October 2009. Additionally, the greater Tokyo metropolitan area increases that figure to a staggering 35 million people! We all know the feeling: we wake up one morning to the realization that the world is not as we would like it to be. A common experience, to be sure, but many and diverse are the ways in which a person may react to it. One man embarks on a quixotic crusade to change the world. A second gives up the world for lost and retreats into whatever protective walls he can erect around himself and his loved ones. A third takes the "practical" approach, accepting the world for what it is and doing his best under the circumstances. A fourth recognizes his inability to deal with the situation and looks to a higher authority for guidance and aid. Our forefathers experienced just such a rude awakening on the seventh day after their exodus from Egypt. Ten devastating plagues had broken the might of the Egyptians and forced them to let the Jewish people go. After two centuries of exile and slavery, the children of Israel were headed toward Mount Sinai and their covenant with G-d as His chosen people and a "light unto the nations." Indeed, this was the stated purpose of the Exodus, as G-d told Moses, "When you take this nation out of Egypt, you will serve G-d at this mountain" [Ex. 3:12]. But suddenly the sea was before them, with Pharaoh's armies closing in from behind. Egypt was alive and well, and the sea, too, seemed oblivious to the destiny of the newly-born nation. How did they react? The Midrash Mechilta on Ex. 14: 13-15 from this week's Reading tells us that the Jewish people were divided into four camps. There were those who said, "Let us throw ourselves into the sea." A second group said, "Let us return to Egypt." A third faction argued, "Let us wage war upon the Egyptians." Finally, a fourth camp advocated: "Let us pray to G-d."
Moses, however, rejected all four options as inappropriate, saying to the people, "Fear not, stand by and see the salvation of G-d, which He will show you today; for as you have seen Egypt this day, you shall not see them again, forever. G-d shall fight for you, and you shall be silent" [14:13-14]. "Fear not, stand by and see the salvation of G-d," is Moses' response to those in despair who wanted to plunge into the sea. "As you have seen Egypt this day, you shall not see them again," is addressed to those who advocated surrender and return to Egypt. "G-d shall fight for you," is the answer to those who wished to battle the Egyptians, and "you shall be silent" is Moses' rejection of those who said, "All we can do is pray." What, then, is the Jew to do when caught between a hostile world and an unyielding sea? "Speak to the children of Israel," said G-d to Moses, "that they shall go forward" [14:15]. The road to Sinai was rife with obstacles and challenges. The same is true of the road from Sinai, our three-thousand-year quest to implement the ethos and ideals of Torah in our world. Now, as then, there are several possible responses to an adverse world. There is the "Let us throw ourselves into the sea" approach of those who despair of their ability to resist, much less impact, the big bad world out there. Let us plunge into the sea, they say, the sea of the Talmud, the sea of piety, the sea of religious life. Let us sever all contact with an apostate and promiscuous world. Let us build walls of holiness to protect ourselves and our own from the alien winds which storm without, so that we may foster the legacy of Sinai within. An old chassidic saying refers to a such-minded individual as a "tzaddik in peltz"–"a holy man in a fur coat." There are two ways to warm yourself on a cold winter day: you can build a fire, or wrap yourself in furs. When the isolationist tzaddik is asked, "Why do you think only of conserving your own warmth? Why don't you build a fire that may warm others as well?" he replies, "What's the use? Can I warm up the entire world?" If you persist, pointing out that one small fire can thaw several frozen individuals, who may, in turn, create enough fires to warm a small corner of the universe, he doesn't understand what you want of him. He's a tzaddik, remember, a perfectly righteous individual. There's no place for partial solutions in his life. "It's hopeless," he sighs with genuine sadness and retreats into his spiritual Atlantis. The SlaveA second "camp" says, "Let us return to Egypt." Plunging into the sea is not an option, argues the Submissive Jew. This is the world that G-d has placed us in, and our mission is to deal with it, not escape it. We'll just have to lower our expectations a little. This Exodus business was obviously a pipe dream. How could we presume to liberate ourselves from the rules and constraints which apply to everyone else? To be G-d's "chosen people" is nice, but let us not forget that we are a minority, dependent on the goodwill of the Pharaohs who hold sway in the real world out there. Certainly, it is our duty to influence the world. But then again, the Jew has many duties: it is his duty to pray three times a day, to give to charity, and observe the Shabbos. So we'll do what we have to. Yes, it's a tough life, keeping all these laws while making sure not to antagonize your neighbors; but who ever said that being a Jew is easy? The WarriorA third response to an uncooperative world is that of the Fighting Jew. He understands that it is wrong to escape the world, and equally wrong to submit to it. So he takes it on, both barrels blazing, striding through life with a holy chip on his shoulder, battling immorality, apostates, antisemites, "Hellenist" Jews, and non-fighting Jews. Not for him is the escapism of the first camp or the subservience of the second--he knows that his cause is just, that G-d is on his side, that ultimately he will triumph. So if the world won't listen to reason, he'll knock some sense into it. "You hope to peacefully change the world?!" say the other three camps. "When was the last time you looked out the window? You might as well try to empty the oceans with a teaspoon." "You're absolutely right," says the Praying Jew. "Realistically, there's no way it can be done. But who's being realistic?" "Do you know what the common denominator between all three of you is? Your assessments and strategies are all based on the natural reality. But we inhabit a higher reality. Is not the very existence of the Jewish people a miracle? Ours is the world of the spirit, of the word." "So basically your approach is to do nothing," they counter. "Again you are employing the standards of the material world," answers the Praying Jew, "a world that views prayer as "doing nothing". But a single prayer, coming from a caring heart, can achieve more than the most secure fortress, the most flattering diplomat, or the most powerful army." And what does G-d say? "Forward!" True, it is important to safeguard and cultivate all that is pure and holy in the Jewish soul, to create an inviolable sanctum of G-dliness in one's own heart and one's community. True, there are times when we must deal with the world on its own terms. True, we must battle evil. And certainly, we must acknowledge that we cannot do it all on our own. It is also true that each of these four approaches have their time and place. But none of them is the vision to guide our lives and define our relationship with the world about us. When the Jew is headed towards Sinai and is confronted with a hostile or indifferent world, his response must be to go forward. Not to escape reality, not to submit to it, not to wage war on , not to deal with it only on a spiritual level, but to go forward. Do another mitzvah, ignite another soul, take one more step toward your goal. Pharaoh's charioteers are breathing down your neck? A cold and impregnable sea bars your path? Don't look up, look forward. See that mountain? Move toward it. And when you do, you will see that insurmountable barrier yield and that ominous threat fade away. You will see that despite all the "evidence" to the contrary, you have it within your power to reach your goal. Even if you have to split some seas. If only you move forward. To be Egypt's "whore" in degradation or Hashem's "wife" in holy covenant? Our "freedom" provides us this choice. When put this way, it's a no-brainer, right? Then why do so many of us choose wrongly? If you are living outside the Land of Israel, you are essentially living in "Egypt." If you say you "can't" come to Eretz Yisrael, then you are nothing more than a slave to Egypt. A free man can choose where he goes. Hashem already set you free from Egypt. Now, it's time you set yourself free. Loosen the shackles in your own mind. Your faith and trust in Hashem is only limited by your own fears of going free and of taking responsibility for your own future. But, you'd better move fast. We're crossing the Sea day after tomorrow! Ever wonder why we count up the omer rather than counting down? It's because we are not just marking off the days until a great event - the giving of the Torah on Har Sinai - we are preparing ourselves for that event. And so, we count up every additional day as we accumulate more and more soul corrections until we stand complete at the fiftieth level of purity, ready and able to contain the light which flows down to us on Shavuot. While you're counting the omer, make it count.! PS: I just want to add that this is the reason for ridding ourselves of spiritual chametz prior to the beginning of this process. As long as our egos are still puffed up with pride, we will fail to see that we have any corrections to make. Only when we have deflated our egos as flat as a piece of matzah will we be ready to seriously and sincerely tackle the job of correcting our character traits in preparation for receiving the Light of Torah. Hodu l'Hashem ki tov, ki l'olam chasdo! Are you ready to leave Mitzrayim?